Add one of the best swings ever seen (where Tiger Woods’ various swing models destroyed his body before he was 40 years old), and clutch putting that only Tiger Woods has approached or equaled (let me know when Jordan Spieth has won more majors with clutch putting, 2 doesn’t put you in this category, by far) – that has G.O.A.T. written all over it. So, let’s talk about the swing, because that’s what I’m all about – Jack Nicklaus had one of the greatest swings ever seen on Tour, when you combine power, accuracy and repeatability, and for a good reason – he swung the way you’re supposed to swing if you want power and accuracy (and repeatability). And what made his swing so powerful? It was his pivot and leverage action, simply put. No more, no less. Jack Nicklaus bombed it past Arnie Palmer, who before NIcklaus was considered the power player on Tour. It wasn’t even close. Nicklaus was listed as 5’10” (and many people who’ve met him say he was more like 5’9″, he was not an imposing man) and not a gym rat – in fact, his nickname in the early years of his career (he took a lot of grief from Arnie’s Army when he became clearly a superior player to the King) was “fatso” or other similar unsavory appellations. So, how did a guy that size drive the ball in excess of 300 yards with persimmon and balata and simply overpower golf courses the way Tiger Woods would do 30 years later? I’ll remind you all of the power of the pivot. I discussed Nicklaus’ pivot mechanics in the “Kinesiology of the MCS Golf Swing” video from last year, and I can assure you that if you’re pivoting in the “perfect pivot” manner of the Ben Hogan action in the “MCS – Perfect PIvot“ video, you’ll get the same action. It’s not rocket science, is simply the principle of athletic motion and leverage. Nicklaus had it and anyone can have it. I can tell you who has it right now – the college player I’ve consulted with on his swing for two separate weeks this year, and his physical dimensions are probably a little less than Nicklaus at 19 (I’d say Nicklaus weighed more than 140 lbs then). I met Blake in late May, and the last time I saw him was last week (mid-July), which makes it less than 7 weeks from the time I first shook his hand to our parting in Texas. 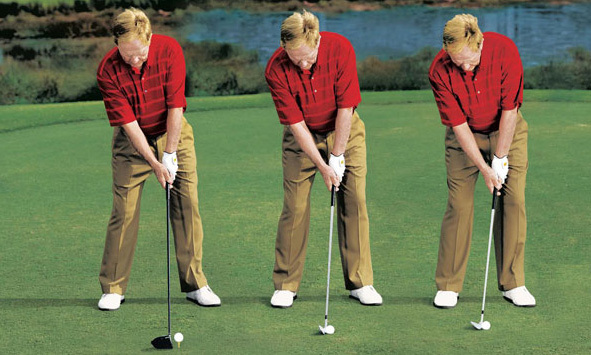 And during those consultations, we worked on his dual pivots – the back swing and down swing pivots. And although he was always a long hitter, he didn’t know where the ball was going when his timing was off. By working on his stance and pivot, he got even more power and leverage into this swing, because all of his flaws not only affected his ball-striking, they were speed-brakes. “I’m going to be even longer?” he would ask me every time I mentioned it, because he couldn’t imagine hitting it any longer. If I remember, he actually laughed when his father told him in May that I was going to Southern California to meet with them, and that I’d told pops I could likely add 5-10 yards to his driving. I don’t care how long you hit it – if I can spot technical areas for improvement – you’re going to be longer after you get rid of them. That 5-10 yards turned out to be a wild under-estimation, as he’s a good 30-40 yards longer on his standard drives, and whenever we worked together on the range, I would see people literally stopping what they were doing and standing back to watch him hit balls. Where does a kid 5’9″ to 5’10” and weighing between 140-150 lbs get the power to hit 4 iron to a 230 yard par 3, or hit a drive that we measured at over 330 yards uphill into the breeze on 12 at Torrey Pines South? Funny thing is, Jack Nicklaus tended to get sloppy with his footwork and had a twisting left foot on the follow-through at times. Right now, that’s the one thing Blake does ’til we get rid of it completely. Some swing changes, you can make very quickly (we straightened out both pivots in two weeks on intensive work), and some take longer, until you can trust the new feel (balance and weight both at address and during the swing) out on the course and can swing that way unconsciously. 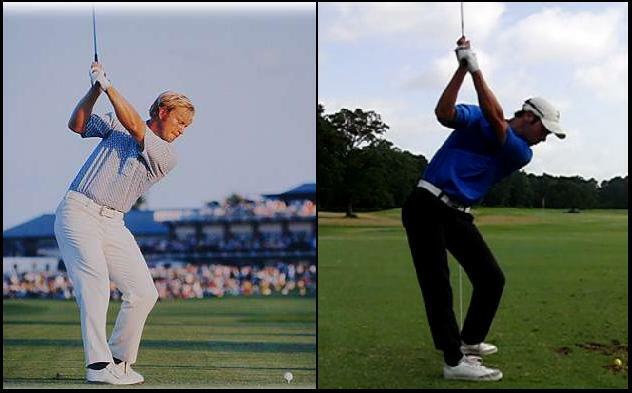 I’ve got a college player at a Division 1 school (McNeese State in Lousiana) looking at the Classic Golf Swing action of Jack Nicklaus and not the Modern Golf Swing junkery of Tiger Woods or Jordan Spieth with which to compare his swing. I’m not calling Blake “Jack Nicklaus,” mind you. Not even Tiger Woods was Jack Nicklaus. But does he swing like Nicklaus? Why did Jack recommend all shots and all clubs to be played inside the the left foot? The ball being in the same position no matter what club being used? Don’t know that he did, TF – I know Hogan did, with his rotating stance line from closed to open. Shifting his stance line while keeping the balls in the same place effectively moved the ball in relation to his overall setup. Nicklaus however…I have to refer to this pic and say I don’t think he did…looks like straight-up MCS to me! 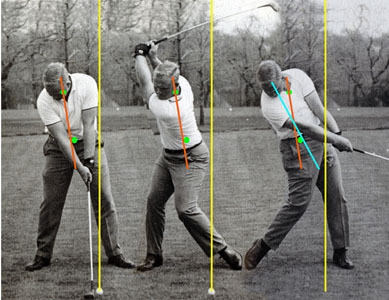 NICKLAUS SAYS: From the time I was very young, my teacher Jack Grout tried to keep my mechanics extremely simple. “Nothing fancy,” he would say. And that included ball position. I try to play every shot with the ball opposite a point just inside my left heel. That is a pure fundamental for me. 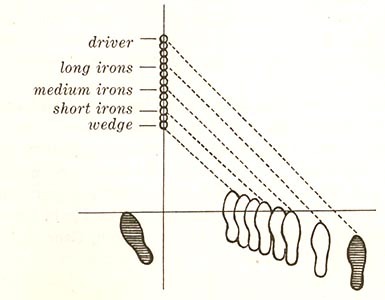 The width of my stance and the distance from the ball to my stance line is dictated by the length of the club. It might appear that I play the ball progressively farther back in my stance for fairway woods, irons and wedges, but that is more a result of my stance becoming narrower. I start with the clubface square to my target, and if I’m swinging properly, it will open going back then return to square at that ball position before closing. FLICK SAYS: Jack plays all his clubs with the ball relatively in the same position. Notice how his hands are in exactly the same place in relation to his left leg, no matter the club. He is meticulous with this principle, and he often asks me to check it for him. His ball position, slightly forward of standard, is very good, especially for someone like Jack who spent most of his career trying to eliminate the left side of the course. And that was also ideal for his more upright swing. But don’t let it get too far forward, which can cause your shoulders to open too much. If you’re trying to draw the ball, you might need to play it a little farther back. That encourages a swing more from the inside. @DJ: The work you have done with Blake is outstanding! One of these bigger name pros one of these days will recognize the truth that the classic golf swwing is…the only golf swing! Thanks, Peter. I think he’s a special talent but that’s because I’ve been privileged enough to see his stuff in person. –Maybe that’s what it was. The driver is teed-up, and you want to catch the ball on the upswing. 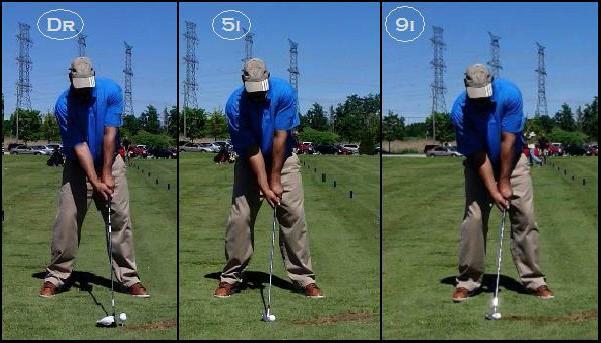 Without changing the swing, seems like putting the ball a touch forward is the natural swing. On the other hand, Snead talked about moving the ball back with progressively shorter clubs. That has the possibility of getting too much into micro-managing…but it worked OK for him. As with MCS, it looks very clear that Nicklaus kept his hands in the same spot for all clubs, and the lean of the shaft of a particular club would dictate the ball’s position. Unless I’m missing something, that’s what it looks like to me.